Hey guys! I know I look like a ghost on this photo, but what can I do I just love Lush’s Ocean Salt scrub so much:) As you have already read above, this post is going to be all about taking care of my skin and how I keep it matte, clear and blemish-free. This is actually the only L’oreal non-makeup product I own (have no idea why). The little flat brush, that comes with it, cleans my pores so well. It’s a great product to use after you’ve been wearing lots makeup for the whole day. Also, a little comes a long way! Pupa is one of my favourite European makeup brands and I was so excited to get this cute little eye makeup remover and a mascara as a gift for my birthday. At first, i thought it wouldn’t work for me because my eyes are increadible sensitive. So sensitive that I can’t apply eye pencil on my waterline, even taking photos makes my eyes ache sometimes. But, unexpectadly, this oily remover turned out to be amazing for my eyes. Love it! I love Beauty Formulas. I’ve tried so many of their stuff, and 85% of them were great. But these nose strips are not only great, they are perfect! The packaging says ‘removes blackheads and dirt instantly’ and it does. Amazing product for a very reasonable price. Totally recommend. I got this Boots Rapid action spot gel a year ago in Bangkok, and i still have it! All because a liitle goes a long way. It reduces blemishes, redness. I usually apply it on pimples before I go to sleep. Rival de Loop is a German brand, which is not very well-known outside of Germany, and I got no idea why. They have good and very affordable products. This one is a roll-on eye gel and I love applying it before I do my makeup. Again if it works for my eyes, I think it’s hyppoallergenic. You can never go wrong with Anatomicals! Throughout the last couple of years I’ve had so many products from this UK brand with quirky packaging. I must say, I have never been disappointed. Great quality, packaging, smell and price. This eye cream is perfect for delicate skin. Read 9:) When I saw this moisturiser at Asos, I knew I had to have it. Perfect for those days, when you are not wearing makeup. I use Nivea All-in-1 skin treatment as a mask mostly, although you can use it as a scrub or a cleanser. It has very nice ‘clean’ smell and antibacterial effect. I’ve been using this mask for a while now, and I can recommend it for people with oily/blemish-prone skin. 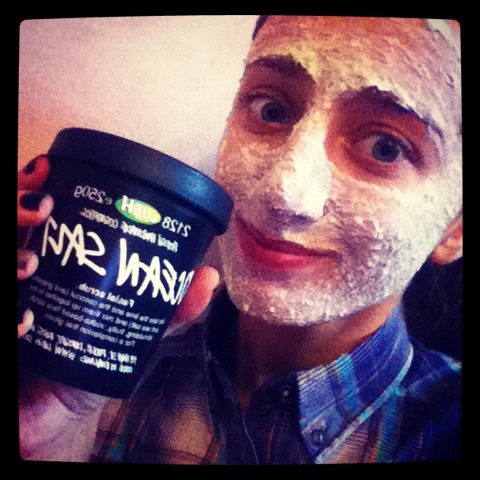 I don’t have many Lush products, but this Ocean Salt scrub ‘screams’ natural, good for your skin and soothing. It’s probably not the best scrub for someone with dry skin, but it works amazingly for my oily/sensitive skin. After applying this scrub I usulally keep it on my skin for 15-20 minutes, then rinse and apply product number 8. 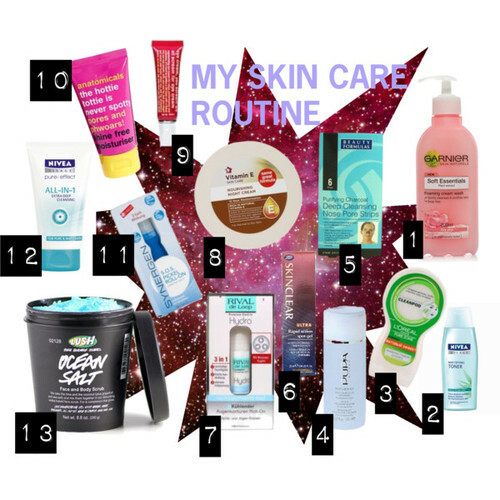 If you are wondering how often I use all of these products, I can say that my golden rule is ‘ALWAYS use an eye cream or gel’. You should start doing that when you are 16. There are plenty lightweight eye gels for young skin. It’ll allow you to stay young as long as possible. I usually use my L’oreal treatment on Mondays, nose strips and Nivea mask on Wednesdays and my Lush scrub on Fridays. I ALWAYS remove my makeup before going to sleep and apply my Vitamin E cream, in the mornings I use Anatomicals stuff if I don’t intend to wear makeup, or if I do, I’d use my Nivea mattifying toner and eye gel.